Posted On January 07, 2016 by Team iCynosure. What happens when you put together the dynamic trio of Stand-Up Comedian Aditi Mittal, Gynaecologist Nandita Palshetkar and Actress Kalki Koechlin along with P&G’s Research Expert Chetan Kotyalkar… the audience cracks up every minute of the discussion. Even when the discussion is about those 5 days, yes the PMSing ones, the time when your best friend visits, oh yes in simple terms the chum jokes. In a room full of women bloggers from across the city, the team discussed the myths surrounding the menstruation period; their experiences and how they #OwnThose5Days to be unstoppable. Kalki spoke about how menstruation in India is treated like a disease and how women are discouraged from doing routine activities and are restricted to their rooms during the time. Dr. Palshetkar ran us through the menstruation process and emphasised the importance of maintaining hygiene and health. Aditi was herself cracking jokes all the time embarrassing the man of the hour Chetan Kotyalkar who took the audience through the entire process of developing the product and how each part of the product has bettered to give complete comfort and protection. Whisper’s last campaign ‘Touch The Pickle Jar’ that is traditionally a taboo during the period encouraged women to defy tradition by actually doing what is restricted breaking gender stereotypes and bring about a change. 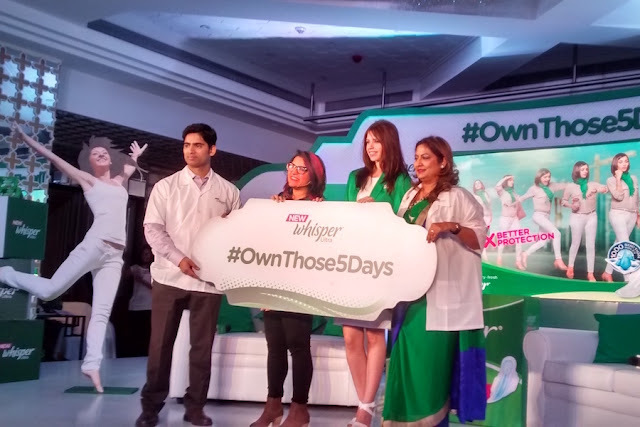 During the #OwnThose5Days Blogger Hangout the panel busted more than just one myth. The one that surely will make me more #Unstoppable is saying no to 'no exercising during my period’ routine. It was fun being put through a series of physical exercise routines to reiterate the thought in a more engaging way than just a talk. Team #14 kicked some real punches competing with other 17 teams to emerge the winner of the challenge. It was really great to see a man talk so passionately about the research that went behind the development of the new Whisper Ultra that offers 5 times more protection from a regal napkin. The new product launched stands apart from the competition with over 1k suction holes on a more softer top cover that ensures more and faster absorption, better dryness and above all odour lock. So my dear girls, do not let any myth stop you from being yourself. Don’t listen to others tell you what you cannot do! Stop worrying about the monthly friend; welcome her with more cheer and applause; and with the much better New Whisper Ultra. And most importantly go, #OwnThose5Days with your free sample to get one click here.